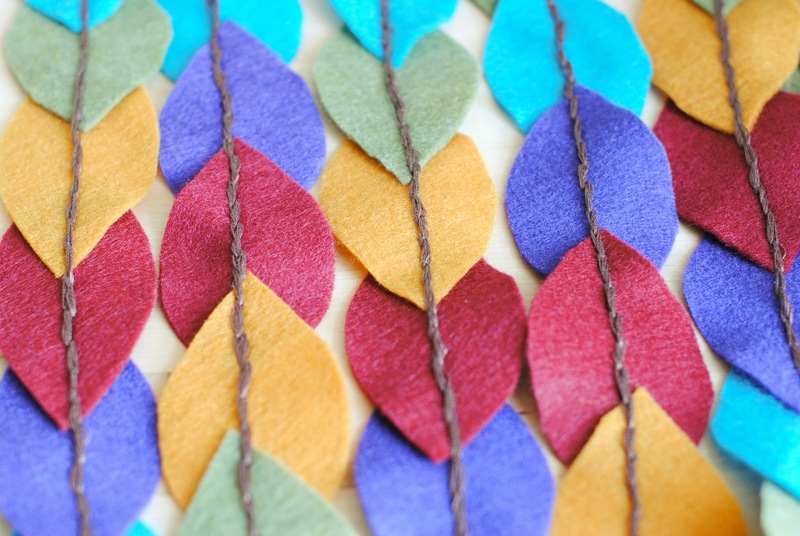 I've seen beautiful, felt garlands popping up all over the DIY blogosphere lately and I've been dying to try my hand at one! 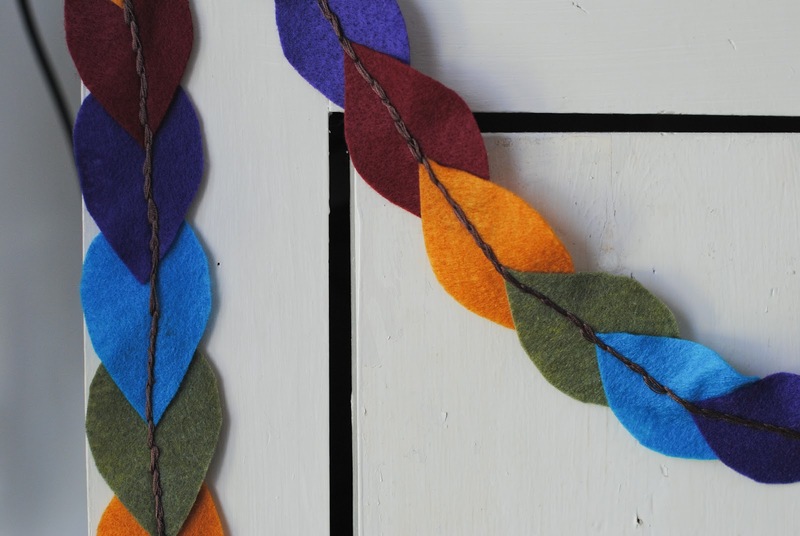 So when I was at the craft store recently, I strolled down the felt aisle... and when I spotted this felt color combination I was completely inspired to make an Autumn Felt Garland. 1. I started with 5 different colors of felt, left over templates from my Paper Bag Leaf Wreath, and some brown embroidery thread. 2. I took one of my leaf shapes, and traced it as many times as I could onto a piece of printer paper. Then I went through my "sewing bin" and grabbed some straight pins and my fabric scissors. 3. 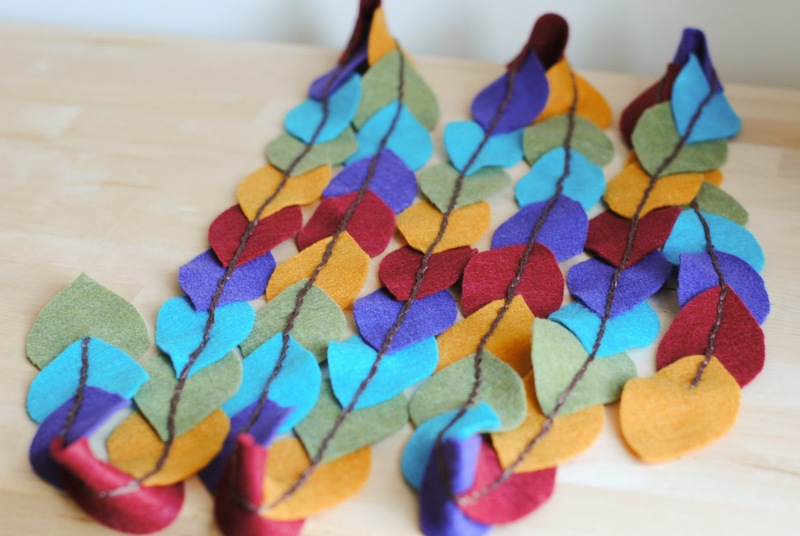 I made a stack of felt 5 pieces thick (one piece of each color) and pinned my page of leaves to the top. 4. And while I watched TV, I cut out all those leaves! 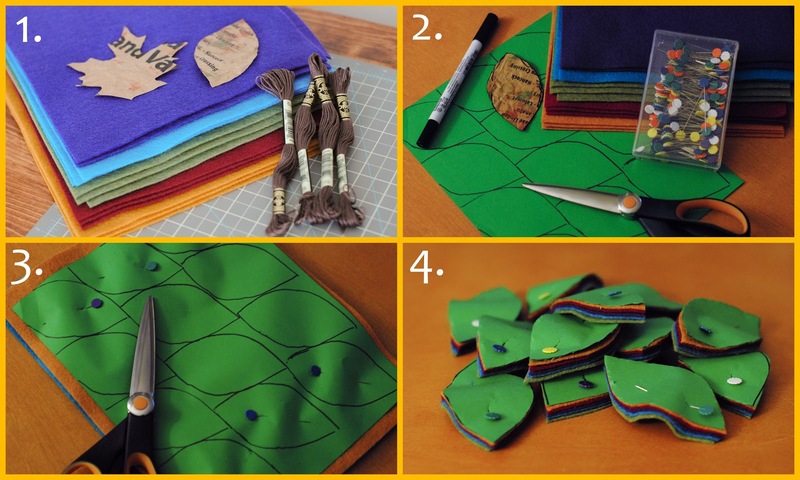 It didn't take very long at all, and I was able to get 60 leaves out of 5 pieces of felt! Once I had separated all of the leaves I had cut, I laid them on top of each other in a Roy G. Biv pattern (I couldn't help myself). I overlapped one end of a leaf to the next before pinning them all together. 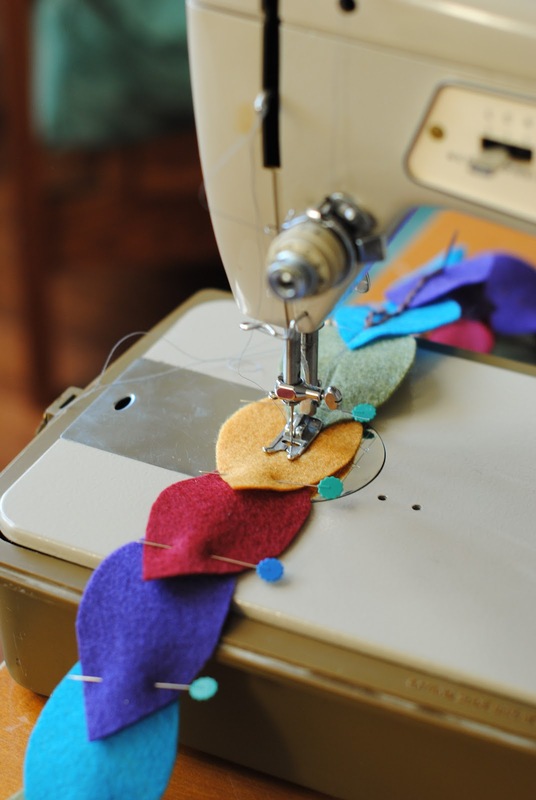 After I had pinned my garland, I lugged out my trusty sewing machine (which is older than I am and still in working condition, which blows my mind every time I use it!) 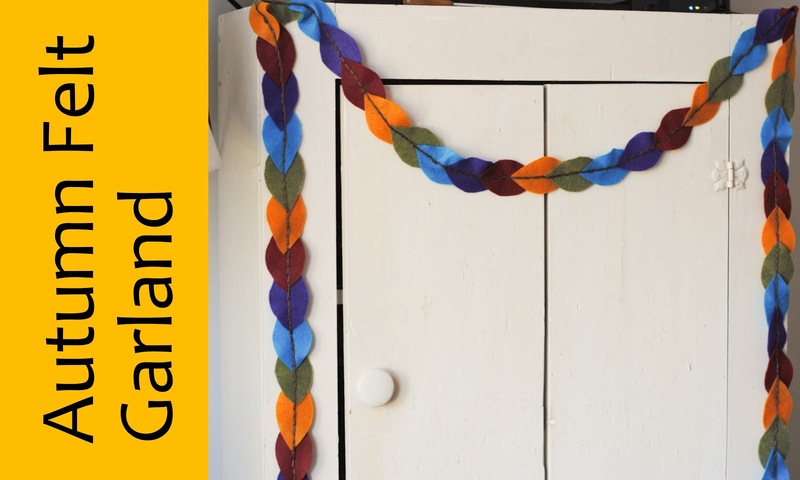 and simply stitched all the way down the garland. I'm not a fan of measuring unless it is absolutely necessary, so I eye-balled the sewing and tried to keep the line of stitches down the middle of the leaves. And truth be told, I could have been done after the sewing... but I wanted a one last touch of autumn... so I hand-stitched using embroidery thread over the line I had just stitched with the sewing machine. 5. 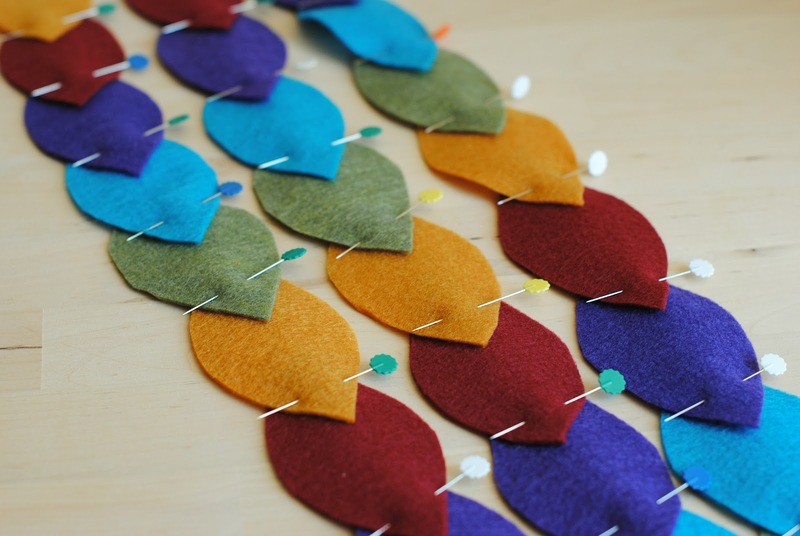 Starting on top of the garland, I started by inserting the needle a little less than half an inch from the previous stitch. 6. When I brought the stitch up from the bottom, I actually brought it up behind the the stitch I had just started, making sure the needle came up between the strands of the embroidery thread. 7. 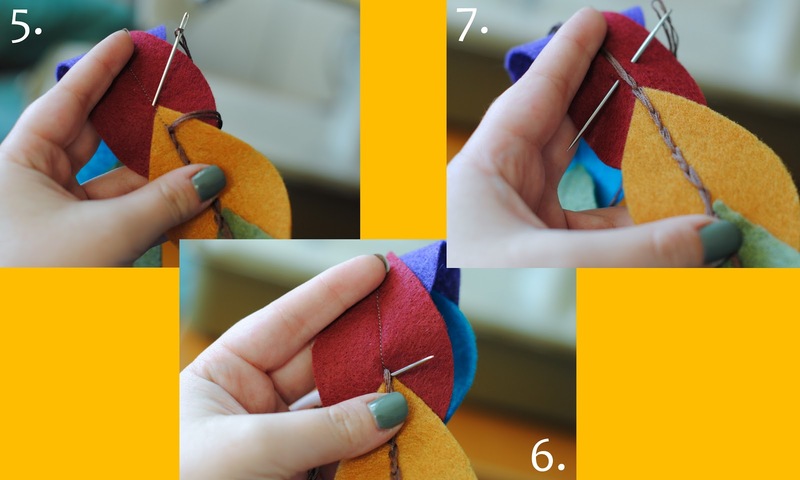 I especially like this stitch because it creates a continuous line of color, as you can see! 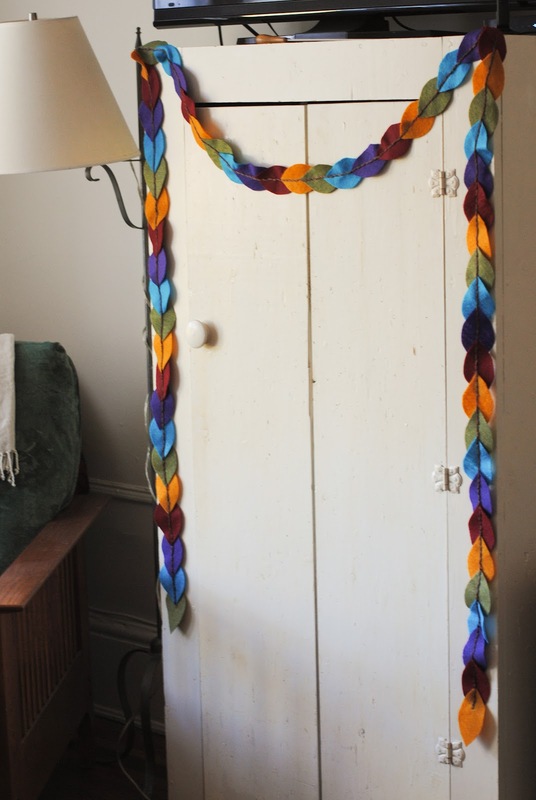 And after all that stitching, my garland was finally finished! Here's an up close shot of all that hand stitching... kind of fun, right? And I used all of the strands of the embroidery thread (rather than splitting it up), so the stitching really stands out! 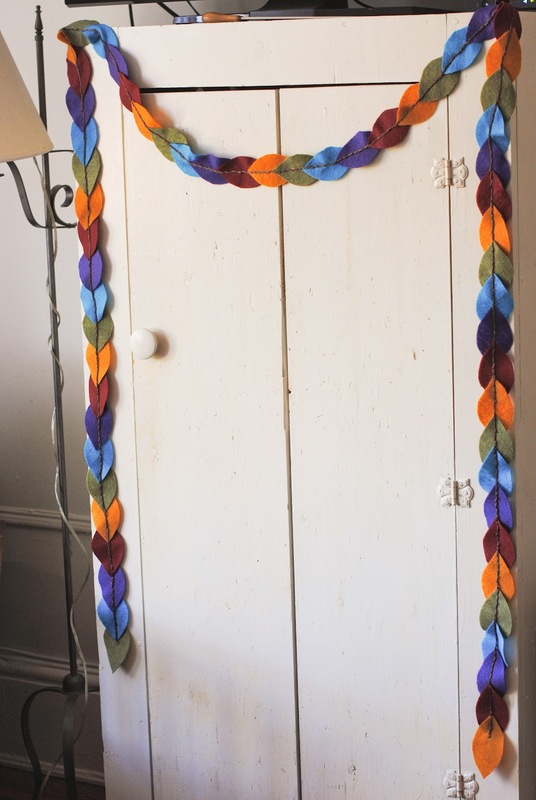 I really like the way this turned out... and for a an hour or two of effort, this garland really adds a pop of festive color to my place! This is really, really gorgeous!! Thanks for sharing.